Product prices and availability are accurate as of 2019-04-20 14:09:42 UTC and are subject to change. Any price and availability information displayed on http://www.amazon.com/ at the time of purchase will apply to the purchase of this product. Just like indoor living spaces, patios need a fashionable focal point like the Home Style Morocco Coffee Table. 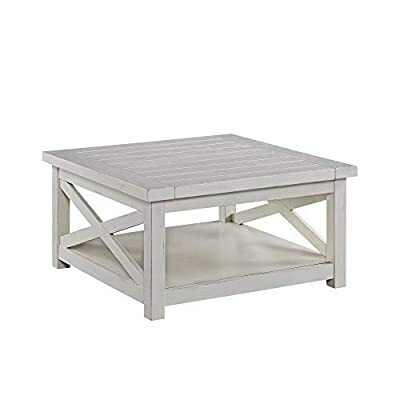 With an elegant inside look you can bring outside, this coffee table is suitable for indoor or outdoor use. The table is crafted of solid acacia wood with a wire brush finish that adds depth and character to the wood. At the top, the hand-laid slate tile surface adds a perfect pop of color that refreshes the porch, patio, sun room, or any room. Finish and measurements may vary slightly. Home Styles is a manufacturer and distributor of RTA (ready to assemble) furniture perfectly suited to today's lifestyles. Blending attractive design with modern functionality, their furniture collections span many styles from timeless traditional to cutting-edge contemporary. The great difference between Home Styles and many other RTA furniture manufacturers is that Home Styles pieces feature hardwood construction and quality hardware that stand up to years of use. When shopping for convenient, durable items for the home, look to Home Styles. You'll appreciate the value. Dimensions: 35.75L x 35.5W x 18.75H in.. Solid acacia wood construction. Hand-laid slate tile tabletop. Wire brush finish on legs. Suitable for indoor or outdoor use.